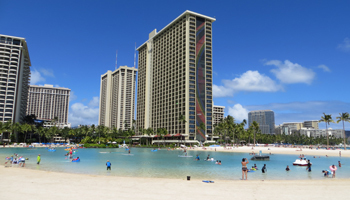 The Hilton Lagoon: a beach within Waikiki Beach. A Fun Hawaii Activity on the Edge of Waikiki! The Hilton Lagoon – short for the Duke Kahanamoku Lagoon at the Hilton Hawaiian Village – is an artificial seawater pond fronting the Rainbow Tower at the western end of Waikiki. Now, I’m not really a fan of man-made beaches – especially when there’s a beautiful actual beach a few steps away! Nevertheless, moms with kids and hundreds of other daily lagoon goers will likely tell you I’m full of it on this one. To me, this is nothing more than a swimming pool with lots of sand. To my kids, however, they don’t care where they get to swim as long as they get at least a few hours in the water. I just wish I understood the attraction this Hawaii activity holds for so many other people – particularly on days when it is packed to capacity with paddle boats, paddle boards, and various other hazards. Regardless, it is one of the more popular activities to do in Hawaii. Maybe that's because it's ideal for paddle boats, stand-up paddle boards, and other such activities - all of which are conveniently available for rental right there on the lagoon shore. I will say this for the lagoon, though: a few years ago the Hilton Hawaiian Village made a lot of capital improvements for the restoration of this Hawaii attraction, and they did a superb job of it! Whereas this used to be a stagnant, ugly-shade-of-green slough in which nobody would dare to dip their toes, it is now a very fresh and inviting swimming hole, which continuously circulates clean ocean water in/out three times per day. In my opinion, the two best reasons to go to the Hilton Lagoon, however, are the Tuesday and Friday night fireworks! You can see the fireworks from many places on the south side of the island, but from the edge of the lagoon, they explode right over your head – and that’s really cool! Best seats on the island! Think you might like to stay at the Hilton Hawaiian Village? Check Rates and Availability: Hilton Homepage .